A prologue and teaser to what I’ve been writing while living on the farm. I was driving east along Idaho’s route 20, leaving the stormy weather, now engulfing the city of Boise to my stern, and bracing myself, as we drove into the blackness of heavy rain. The radar showed a ring of red all along our route east. My stomach anxious. It was becoming late in the day and still needed to secure a safe place to camp for the night. Along the route, just south of my final destination of Sun Valley, ID, a bird sanctuary. The description submitted by an RV’er, suggested it to be a suitable place for a night’s stay, with a pit toilet (BONUS!) Relying completely on the words of a stranger, google maps, and my gut — drove into the dying day. Hopeful we’d find this secluded flat spot before the incoming rain and darkness overtook us. We drove along, jagged snow-capped mountains of the Sawtooth National Forest to the north, and to the south, vast prairies with rounded buttes scattered about. Taking a right off the main road, proceeded to follow the directions of google, nervous, and worried. The day had nearly expired and this one spot was my ONLY option for the night. With the light fading, and eerie blackness closing in, we made our final right-hand turn onto a well-maintained gravel dirt road. Reassured by the sign designating our safe arrival to a Wildlife Management Area. 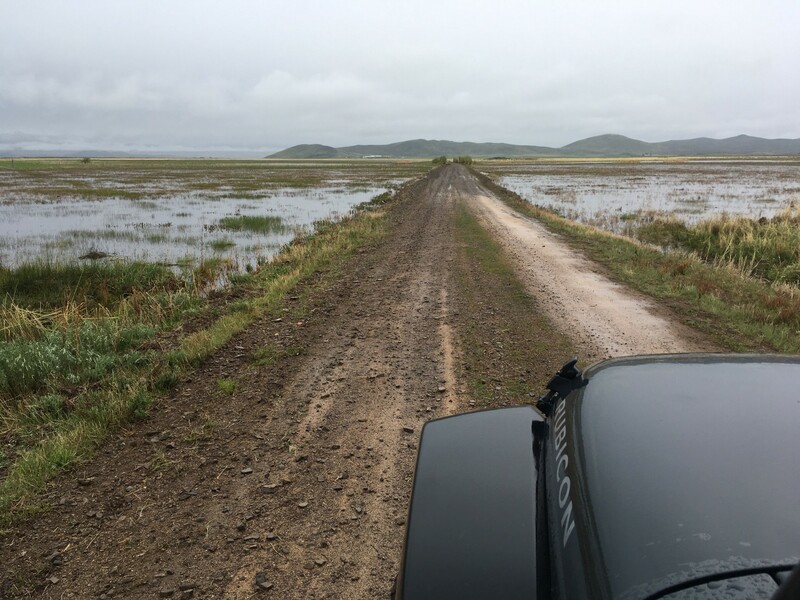 There was only one concern, as I navigate the access road, the water on either side was damn near level TO the road itself! Proceeding cautiously, as the lack of light made the flatness of the surrounding water, share similar appearance as the road. Now was not the time to test the Jeep’s ability to float! Distracted by the exceptionally loud birds, flocking around like a scene out of the Alfred Hitchcock film, in awe of how colorful and beautiful it was. The views were remarkable, albeit, ominous. I’d come to the end of the road. There was plenty of room, informational signs, picnic area, and the all important toilet. Temporarily parking to let Monty out to stretch his legs, feeling quite stiff myself from the day’s travels; it occurred to me I brought a bird dog to a bird sanctuary. The birds where not singing for joy. Warning calls of every amplitude, a reminder to check my surroundings. Driving in, I noticed how this camping location could easily become an island with the significant rain we’d encounter that night. Looking around for any signs, or suggestions, the Jeep was parked in a wet zone. Meanwhile, also looking up. There were trees everywhere, filled with squawking birds. Two important things to keep in mind, when traveling solo via overland. Do NOT park your rig where it may become flooded, and do NOT park your rig under, or to the leeward side of anything which may blow down. Landing on you — in your sleep. There are two simple rules to follow that will help your loved ones sleep better. These were two rules I had to break on this night, where I was surrounded by stormy weather, parked in a small patch of land surrounded by water, and trees. If my father knew, he’d been awake the entire night, worried! All these important decisions had to be made quickly. It was nearly dark when I pulled in and the first line of heavy rain, only minutes away. I backed into a spot with zero clues of pooling water. Physically looking around, eyeing the compass, and surrounding trees. Nothing too big, and in the event of branches, or whole trees coming down, not a direct hit to the Jeep. I stepped out for one last trip to use the toilet, before seeking shelter inside the Jeep. I don’t recall eating that night, though did prepare a hot cup of tea. Began to organize our tiny home, feeling ready for whatever the morning brought. Worse case, wake up to the road covered in water, calling the spot home for another night. It had been a long day of driving, most of which, fun. The last few hours, not as much. My eyes and mind — tired. Monty already tucked in for the night, time to do the same. Shockingly, there was cell service, and appreciated the opportunity to send out a few notes, and scroll through social media — catch up on the lives of friends and family back east. I’d open Instagram to be hit with shattering news. My heart sank, and just as the rain began to fall, so did the tears from my eyes. The weight and magnitude of my journey became heavy. My Jeep, a safe haven from the storm and world. Monty my co-pilot and now comforting companion. I’d cry myself to sleep that night, forgetting about fears of becoming trapped. Giving in to the darkness of both the day, and of life. Photography + Words by Jennifer Langille. Author Note: In early 2018, I set out in a Jeep with my dog Monty to travel around America. Navigating Challenging Landscapes is my story of slowing down to tackle the physical challenges only a Jeep can tackle. With each obstacle presented, I was forced to reflect on the past while living in the present moment. Learning from those I met along the way impacted by cancer, and returning home with a refreshed perspective on dealing with the uncertainties of life.